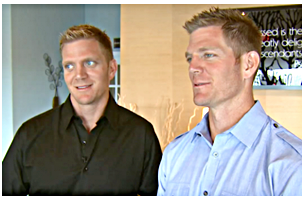 Ever since HGTV had decided not to move forward with a reality TV show starring those christainically twisted twin brothers Jason and David Benham, who have compared gays to Nazis and warned marriage equality will destroy society, they have been playing the extremist right-wing “christian” circuit and milking it for all its worth. And this week is no exception as they “matyr up” at Tony Perkin’s and the Family Research Council’s annual HATEROPOLOOZA Values Voter Summit. Best line: We went into Jason’s house, shut the door and put our phones on the dresser and got on our knees and FILL IN THE BLANK . EAT MORE HATE – NOM’s Brian Brown Calls For EVERY Wednesday To Be Chick-fil-A Hate Day!